Best Deviled Egg Recipe: Learn To Make The Best Deviled Eggs Ever! 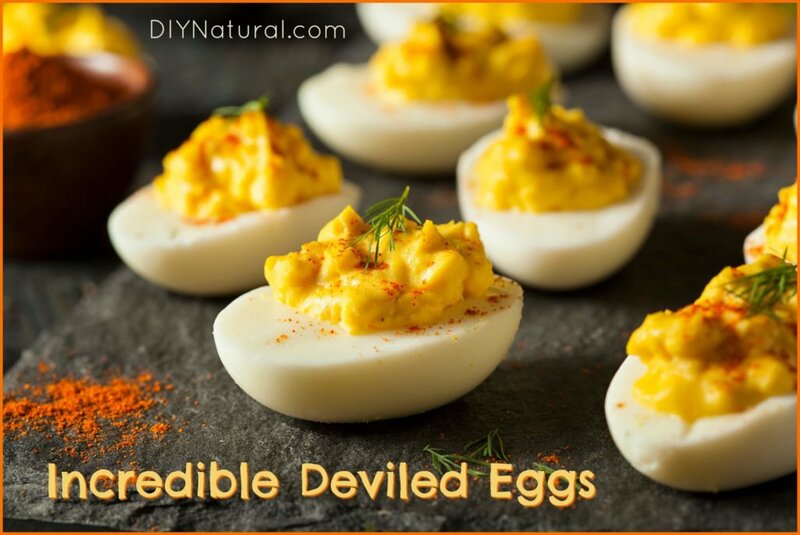 Home DIY Natural Blog Food Learn How To Make The Best Deviled Eggs Ever! Summer, to me, means food. I love cooking out, having picnics, and hanging out with friends. There’s nothing better than brats on the grill, a glass of iced tea, and a plate of deviled eggs. After some trial and error with deviled egg ingredients, I finally formulated a fantastic recipe. And this is the best deviled egg recipe I have ever had! Any good deviled egg recipe starts with the eggs. I raise chickens, so I use my own eggs. If you purchase eggs, try to find them locally or at least pasture raised or free range. The chickens will be healthier and the eggs better tasting. Make sure the eggs are fresh, but not too fresh. Eggs that are too fresh are difficult to peel. The color of an egg makes no difference in the taste; it’s all in what the chickens eat. My girls get a good organic crumble with added scratch grains to get them moving. I let them free range for about an hour before sunset which gives them a lot of bugs and grass, so I get really orange yolks from them. Here is my best deviled egg recipe. I know you’ll love it! Note: All amounts listed are approximate. Amounts depend on taste and how moist the eggs are. The recipe will give you starting points, but you’ll need to adjust the amounts according to what you like. Cut eggs in half and place the yolks in a bowl. Mash them with a fork to make a fine crumble. Add a tablespoon of mayonnaise, a teaspoon of onion, a teaspoon of dill pickle relish or mustard, a tablespoon of chopped dill, and a grind of salt and pepper. Mix thoroughly and test the consistency. It should be a smooth paste. If it needs more moisture, you can add more mayonnaise or some pickle relish juice. Once you get the consistency and flavor you like, drop spoonfuls of the mixture into the hole in each egg. Sprinkle with paprika, or for a twist, a bit of cumin. Add a dash of cayenne or chipotle for a spicy kick. For a unique flavor, mince some capers and substitute them for the pickle relish. If using capers, you may want to cut back on the salt. Add a tablespoon or so of baking soda to the water when boiling the eggs. It helps the shells come off easier. But too much can make your eggs taste funny, so stick with a tablespoon. After boiling, poke a small hole in one end of the shell with a pin. This will allow the shell to separate from the egg internally, making it easier to peel. Boil the water first, then gently lower cold eggs into the water. Boil for 10 minutes and let cool. Add a tablespoon of white vinegar to the water. It doesn’t matter if the water and the eggs are cold or room temperature. Older eggs peel better than fresh ones. Cooling eggs quickly in an ice bath also makes them easier to peel. If you have this gadget, it says it cooks eggs perfectly every time, and they peel well! Add a tablespoon of olive oil to your water as you boil the eggs. The shells will come off perfectly every time! Using a teaspoon of salt in the water helps the shell come off without damaging the eggs. Boil eggs as you normally would, then crack them a bit before submerging them in cold water. Wait 10 minutes, then peel. What’s your favorite addition for making an incredible deviled egg? Share with us in the comments! I finally figured out how to peel fresh laid eggs, I put eggs in a pan of cold water. I boil for at least 20 minutes on med to med low as long as they are boiling lightly. now the trick is not to Put cold water in the pan to cool off eggs leave them hot pour out the water, wait a little bit and peel as hot as possible, after you crack the egg and get it to peel place under the sink of cold water and let the cold water hit the area you are peeling and it helps to release the shell! I don’t have exact recipe measurements (like the way my Mom used to cook). My deviled eggs are made with mayo (no Miracle Whip), yellow mustard, a bit of horseradish, some lemon or pickle juice, salt, pepper, and garlic powder. I top them with paprika and/or chives. And I never take any home from a party! We Love deviled eggs, using mayo, with half sour cream. We use Apple cider vinegar, and also Horseradish sauce (it’s a mixture of mayo and horseradish. And, crushed garlic, either raw or pickled. Yumm!